Have you started your mileage run for 2015? Strategy for a couple to stay 5 days in a Top Hotel and fly for almost free to any destination ? Here is a simple strategy using credit card sign-up and some limited time offers that a couple can utilize and travel for almost free to most destinations in US, Caribbean, Mexico. I think its a great value you are getting (4 domestic tickets, 5-7 night stays and $440 travel credit) in the first year even after paying $295 in annual fees. Just a word of caution that Capital one does a credit check on all three bureaus unlike other credit card issuers who typically just check one. You may also consider the Barclay Arrival World Elite Master Card which also gives you $440 in travel credits and is one of my favorite cards out there and that is the reason I am keeping it for the second year. I am offering FREE Travel coaching to help you plan your next trip. This will typically be done via skype/phone call for a 30 minute consultation. Feel free to drop me a line I’d love to hear from you. US Airways off peak award space to Europe is wide open. For travel between January 15 and February 28, 2015, you can pay as little as 30,000 miles round-trip to tons of top cities like London, Paris, Madrid, and Dublin. US Airways has incredible discounts on the miles needed for a roundtrip award to Europe and the Caribbean during off peak dates (January 15 – February 28 for Europe and September for Caribbean). Off peak awards require finding Saver award space on all legs from your home airport to your destination, and flying all US Airways planes. That is, you cannot fly partners, including American Airlines. 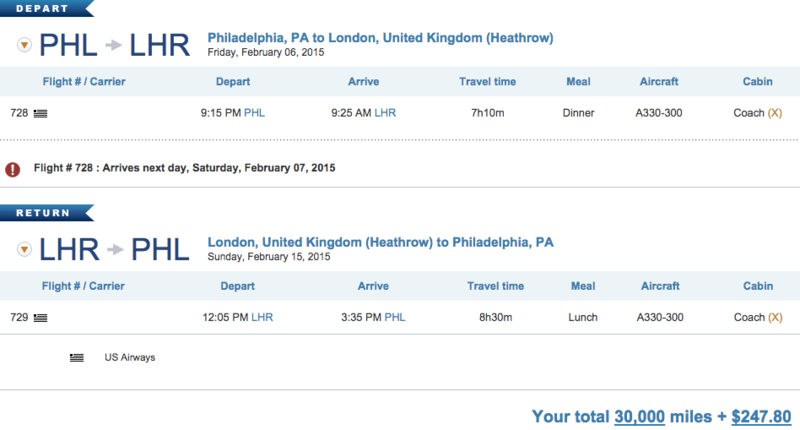 The off peak price is 35,000 miles roundtrip to Europe. Folks with the US Airways® Premier World MasterCard® get an automatic 5,000 mile discount on all US Airways awards that fly only US Airways planes, which is a requirement of off peak awards. That means US Airways® Premier World MasterCard® cardholders pay only 30,000 miles roundtrip to Europe during off peak dates. Right now the US Airways® Premier World MasterCard® comes with 50,000 bonus miles after first purchase and payment of an $89 annual fee. You’ve got the major tourist cities like London, Paris, Rome, Amsterdam. You’ve also got some smaller ones like Munich and Manchester. From Charlotte in the winter, the only US Airways flights are to London and Frankfurt. Off peak awards from anywhere in the United States to Europe are 35,000 US Airways miles roundtrip or 30,000 miles if you have the US Airways® Premier World MasterCard® like me. You can purchase additional 10,000 miles (currently with 3,000 bonus miles) for $295. With the annual fees of $89, additional 10,000 miles to be purchased for $295 and the award processing fee of $100 for two tickets you are looking to spend a total of roughly under $500 for a round -trip ticket to Europe for 2 people this winter. In addition, you have to pay government taxes and the standard $50 US Airways award processing fee. 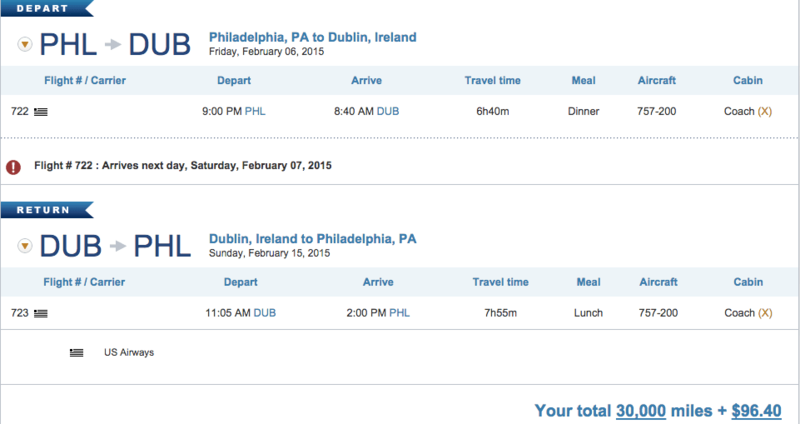 There are several destinations that cost ~$100 all in including Rome, Madrid, Amsterdam, Brussels, and the cheapest of all, Dublin at 30,000 miles + $96. The most expensive destination is London because of the UK’s Air Passenger Duty. It costs 30,000 miles + $248. Your results will automatically display in a color-coded month long calendar. The color-coding is a bit annoying because every level of award space is a shade of blue, but the lightest ones are off peak awards. Off peak award space is wide open. Basically six days a week in both directions. Award space every day in February except for one in both directions. Award space the vast majority of days in both directions. Again, broken record, award space almost every day. Off peak awards are easy to search and easy to book with US Airways miles. If you don’t mind visiting Europe in winter (and missing the crowds), you can book a roundtrip for 35,000 miles or 30,000 miles if you have the US Airways® Premier World MasterCard®. To most cities in Europe, off peak award space is available almost every day from Philadelphia from January 15 to February 28. Find award space from your home airport to Philly at the Saver level and book your vacation today.